Bihar School Examination Board has been given the golden opportunity to the students of BSEB Intermediate who have passed in the BSEB 12th Compartmental Examination 2018. 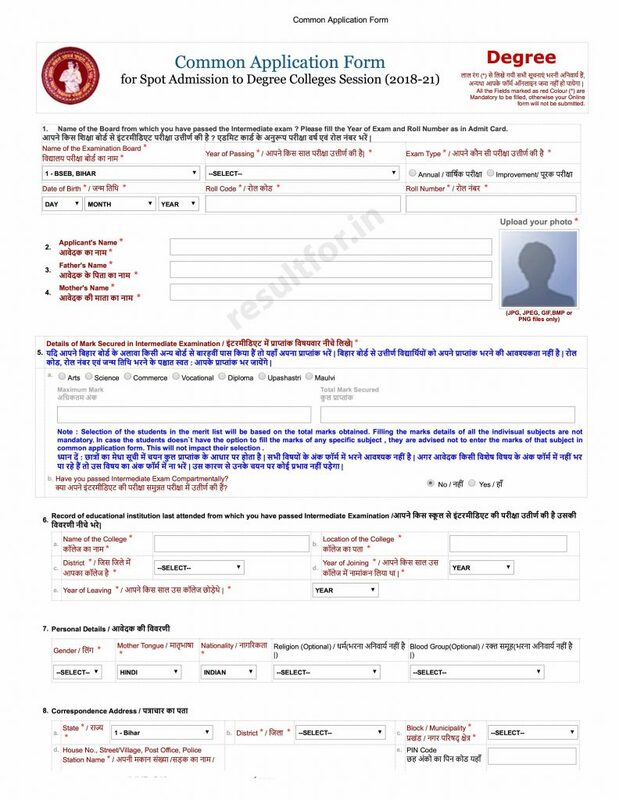 Students who wish to get admission in the Graduation/ Degree course eg Ba BSC or Bcom they can apply BSEB OFSS Spot Admission Application Form. Here is about for whom who search for how to get direct admission in under graduation or spot admission in BSc or ba/BCom. BSEB has been open the link for the sport’s admission for the students who applied but yet not get admission intimation letter and students who passed in the Supplementary examination such students can apply for admission. Below we have mentioned the BSEB OFSS CAF Degree Course Admission Apply Process. Students over the net searching that how to get admission in BA Hindi, English, History hons or Bsc Physics, Bio, chemistry or Bcom such students after the passing in the intermediate supplementary exam or students who yet not applied such students can apply online for the spot admission 2018. Below we have mentioned the how to apply and how to download BSEB Degree Course Intimation Letter for the Admission. A page will be open अगर आपने पूर्व में कोई आवेदन नहीं भरा है (Spot Admission) स्पोर्ट नामांकन हेतु फॉर्म भरकर प्रिंट करने के लिए यहां क्लिक करें! Then Download Admission intimation Letter using the same user id and password which you got through SMS. Still, Having any query or want to know anything about the Bihar Board all 10 University Colleges Degree course admission then you can visit at www.ofssbihar.in or ask through the comment. Sir 3rd list me name aagaya hai but college se mark sheet, SLC, nahi mil raha hai aur 10 tak hi date hai admission ka. Kya kare sir? Aapko SLC Mil Jayega tatha aap marksheet jo internet se download hua hai use le kar aap admission le sakte hai, Aapko application par likh diya jayega due hai deposit karne ke liye. Meri sister ka admission ho gaya hai but college me sport admission khoje hai sport ka date kab tak hai sir. Mera college me spot online ka process verify ho chukka hai lekin date khatm ho jaane ke karan mera rasid nahi kat paya .